• How to download and use Air Explorer? • How to buy Air Explorer and get all its features? • Does Air Explorer use external or own servers to any function? • クラウド サーバの 2 つ目のアカウントを追加できませんか? • How to exclude files in the synchronization? 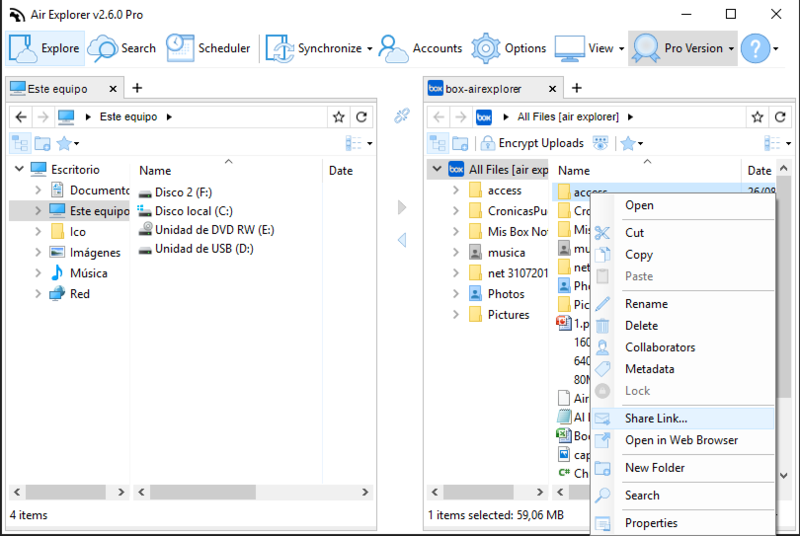 • How copy/paste or drag&drop between Air Explorer and Windows Explorer? • How to add Yandex account with 2factor authentication? • What are the command line exit codes? Air Explorer can be installed in any computer with Windows XP, Windows Vista, Windows 7, Windows 8, Windows 10 and Mac. ¿How to download and use Air Explorer? Does Air Explorer use external or own servers to any function? Air Explorer never use intermediary servers. When Air Explorer upload and download files, it doesn't use any external server for the management of them. The files go directly from the local disk to the cloud you choose. When the files are exchanged between two servers, the files don't go through any external server, they pass by your computer which functions as an intermediary. The account settings are also saved locally on your computer. In this way, your files and configurations always are private. With the scheduler function of Air Explorer you can leave prepared the tasks of synchronizing and transferring files so that they are done in the schedule that you decide automatically. Once you add a new task, the scheduler window will open. In this window you have to specify if you want to schedule a copy or a synchronization. You also have to indicate the schedule in which the task will be carried out. Once the task is scheduled, in the main scheduler window you will see the task with a brief summary. Scheduled tasks will run in the background even if Air Explorer is closed. To exclude some concrete files it is not necessary to configure some rules, just find the files in the synchronization tasks list and click on the synchronization action icon and select "Do nothing". However you can set up rules to exclude multiple files easily. To configure the rules, click on the "Filter" button in the synchronization configuration window. -Each list item must be a file or directory path relative to synchronization base directories. -Each item must be in a new line. -Wild cards * may be used, they mean zero or more characters. -Always use the charater / for directory separators. -Exclude all txt files in folder1 and subfolders: "/folder1/*.txt"
How copy/paste or drag&drop between Air Explorer and Windows Explorer? Hash value is a digital signature for each file. By comparing this signatures Air Explorer can know if the files are the same so Air Explorer in that case does not updated this file while synchronizes. There are different hash functions and each cloud uses one of them. The hash comparison only can do with clouds that use the same hash. -md5: local, 4shared, Google Drive, Amazon, Baidu, pCloud. -No hash: Hidrive, OneDrive, FTP, WebDAV. How to add Yandex account with 2factor authentication? Yandex is a Russian cloud storage that give you 10 GB of free storage. You can add it easily in Air Explorer. Once you have registered in Yandex, you just have to add your username and password in Air Explorer to add the account. If you have a Yandex account and you have enabled 2factor authentication then you have to do one step more to add your account in Air Explorer. You have to enter in your Yandex account panel and generate an application password. Then, add your username and the new password that you generated in the application password. Now, you can use your Yandex account in Air Explorer. Air Explorer has the option to use a command line to start a synchronization automatically. If you want to use it, first you have to save a synchronization. Then, write the command: AirExplorer.exe -runsync [SyncName] Repalace [SyncName] with the name you used to save the synchronization task. This command can be used in the Windows Task Scheduler to Schedule periodic synchronizations. Air Explorer has a command line client that allows you to perform some operations with the cloud servers without having to open Air Explorer. It can be very useful to automate file transfers,synchronizations, etc, in batch jobs that can run automatically. The first step is to activate this function in the Options screen. It is only available for Pro accounts. Remember to add your command line password. To access the command line window you can open the CMD from the start menu or from the shortcut in the "View" menu. -Accounts: list all the accounts defined in Air Explorer. -Copy: copies a file or a folder to another location in a cloud server. -Delete: deletes a file or a folder in a cloud server. -dir: list all the files and folders in a cloud server folder. -Download: downloads a file or a folder to a local folder. -Mkdir: creates a new folder in a cloud server. -Move: mover a file or a folder to another location in a cloud server. -Quota: shows the used and free space in a cloud server. -Rename: renames a file or a folder in a cloud server. -Runsavedsync: loads and runs a saved synchronization. -Transfer: transfer a file from one cloud to another. -Upload: uploads a file or a folder to a cloud server. To run the operations you can follow the instructions shown on the command line panel. To upload a file (fileName.doc) to a cloud server (Box) in a specific destination folder in the cloud (/documents). What are the command line exit codes? -0 Command executed without issues. -1 Command executed well but some files were ignored (some the files were already synchronized or, for copy operations, the overwrite option was not selected and some file(s) already exist. -2 Command executed well but no files were copied (all the files were already synchronized or, for copy operations, the overwrite option was not selected and the file(s) already exist. -4 Error. Check command output or logs for the error details. -8 Partial error. Some files were compied well but other files failed. Check command output or logs for the error details.